"I thought it would lead to increased productivity, efficiency and living standards and stimulate policy reforms. On that front so far it has been a failure." The Daily Telegraph reports Mr Clarke as saying that the single currency was causing severe strains within the southern tier of the eurozone. Late last month Silvio Berlusconi said that the euro had been a "rip-off", a "disaster" for Italy and had "screwed everyone". The "one-size-can't-fit-all" problem was always one of the main reasons why eurosceptics opposed British membership. Mr Clarke has also given up on the EU Constitution - another European project for which the former Chancellor had been a leading champion. "There is no way of rescuing the treaty," he now admits. Mr Clarke says that euro membership is probably off the agenda for "ten years or more" and must hope that this mea culpa will encourage a Eurosceptic party to elect him as its leader - third time round. The same hope was behind last week's willingness to end his tobacco industry interests. Lord Heseltine was on the Today programme this morning puffing up Ken Clarke's candidacy by saying that he remains the most popular Conservative in the country; "head and shoulders" above the other candidates. He appeared, however, to distance himself from Ken Clarke's revised euro views by saying that it was "dangerous" to make "early" judgments. He hoped that the euro would still "settle down" and force inflexible economies on to the road of reform. Lord Heseltine also also effectively confirmed his support for a Clarke-Cameron ticket but "supporters of David Cameron" have told the BBC that their candidate has no intention of forming an alliance with Mr Clarke. In the same Radio 4 interview Lord Heseltine was not hopeful about the Conservative Party forming a government after the next election. He thought it perfectly possible that Labour could lose its overall majority but it was difficult to see the Tories gaining a majority or any other party supporting them in office. Click here for today's David Cameron interview with ePolitix.com. So let's get this straight. Although he does not actually say so directly, Clarke was wrong about the single currency and the European Constitution. In case he hasn't spotted it (because he did not actually say it)...HE WAS...WRONG!!! And has been for years. Britain's relationship with the European Union, and its consequences for Britain's relationship with the rest of the world, have been amongst the most important issues of our time. Europe has defined our Party for a generation, in an entirely damaging way. That damage was caused because a handful of people at the top of the Party - Clarke and his cheerleader Hezza being two of the most prominent - were entirely out of sympathy with the great majority of the parliamentary party and wider membership. Recent events in Europe now vindicate the arguments that Euro-realists have been making for years. Throughout that time they were treated with less then genial contempt by Clarke, Hezza and co. Yet, as Clarke now appears to be beginning to realise, it was he, not the Euro-realists who was wrong. That's right, Ken. On one of (if not the) most important issues of our time, you were wrong. Not only that, but the consequences of your ill-judgement have led to the Party pretty much destroying itself. Please could somebody, somewhere, anywhere, explain how the fact that it is now evident, even to Ken, that he was wrong, somehow qualifies him to lead the Conservative Party? Looking to the future, we now need leadership that can envision and create first a new understanding of the role that the European Union has, and then the architecture to make that a reality. Ken Clarke is absolutely unqualified to do that. The Euro and the Constitution were yesterday's issues and on both Ken Clarke was found wanting. When tomorrow's EU issues arrive, we can expect this Federast to come down on the wrong side of the argument once again. He should keep his lucrative jobs and dodgy views and forget about leadership. A cynical move from Clarke – but that’s what we’ve come to expect from this tedious contest in which the candidates have said very little of substance or interest. All the Leadership contenders seem to assume that the electorate for the Leadership contest will be solely their parliamentary colleagues and so it is unsurprising that they make little effort to communicate more widely. If we carry on talking to ourselves (and a narrow sub-section of ourselves) in this self-indulgent and vain way, instead of rolling up our sleeves and taking on Labour, then the analogy of bald men fighting over a comb will start to appear a little too close to the truth for comfort. Mr Clarke said that he was still strongly in favour of Britain joining the Euro when he was campaigning at the General Election. He also said that he was in favour of the EU constitution. Three months later, he changes his mind as prepares to stand for the leadership. That is pure expediency. As a Eurosceptic, I admired Ken's willingness to stand up for what he truly believed in. That is no longer the case. I sadly have to agree with Adrian Owens about the state of the leadership election. This election is about personalities not policies and that is a shame. And where is Her Majesty's Opposition? Given the number of problems Labour is facing, wouldnt it be great to see the candidates really go and fight Labour instead of posturing against their own party? The most scary thing is that the Lib Dems can come in and oppose the Government while the Conservatives are not watching. I thought people realised by now that there are no votes to be gained by talking about Europe. If Ken Clarke has some interesting ideas about revitalising both the Conservative Party and British society then he can be a serious contender. My problem with Ken is that I think he just wants to be Prime Minister and has very little else to contribute. I think you are being a little bleak. There are some good ideas out there - although agreed that those ideas need some more fleshing out. Willetts & Fox have both given some interesting speeches which could give shape to a Conservative Party focussed on restoring dignity to the poor, excellence to public services, and putting human rights, democracy and free trade at the centre of our foreign policy. Less has come from the two front runners. One of the main criticisms of both of them (which bloggers here and elsewhere have been astute to point out) is that DD has focussed too much on personal narrative and DC on youth appeal. Surely it is somewhat naïve to believe the issue of Europe can be swept under the carpet for 10 years. Whilst Ken may want the issue of Europe not mentioned – surely the labour party would goad him at every opportunity into taking a stance that would be at odds with the majority of his party. I’m just not sure how electorally helpful such a situation would be. Let us all give thanks once again that we never made Ken our leader. We all know the last ten years have sometimes been a bleak and stoney road, with the whole world telling us we were mad not to have the cuddly one leading us. But it was us that prevented the inevitable stitch-up between Ken and Tony, which today would have us right there in the Euro soup. We should take pride in that. i) He has shown himself to be flexible on the European issue. He is far too good a politician to allow yesterday's debate to restrict today's discussion. ii) Most of the 'one nation' ideas being mentioned by other candidates as a way of revitalising the Party were being mentioned by KC years ago? He would not be the first politician to change his/ her mind on Europe. After all, it was Thatcher who negotiated the biggest hand over of sovereignty in recent history. Isn't it about time that we stopped navel gazing about Europe and instead concentrated on selecting the best person to beat Brown at the next election. If we get it wrong this time, putting dogma before electoral necessity, then our time as a credible alternative government could be limited. Liam Fox and David Willetts may have sketched out a partial picture of a future Conservatism, and Dr Fox has indeed talked about human rights at the centre of any foreign policy. However, this serves to underlines the current problem with this Leadership contest. Dr Fox talks in strategic terms and no-one is listening. When a specific issue comes up, e.g. the deportation of failed asylum seekers to Zimbabwe, Dr Fox pulls his punches. He merely says that the government should stop deportations only “if reliable evidence comes to light that any of those deported so far have been victims of the Mugabe regime". Dr Fox is experienced enough to know how difficult obtaining such evidence from a dictatorship will be. And so, as specific issues arise where we have the opportunity to shift people’s perceptions of our party we seem unable to construct a message which will cut through the layer of cynicism with which the public protect themselves from political spin. If we are to change our party brand image we will need to take calculated risks. I don’t see any of the contenders doing more at present than shadow boxing. Oh come on Benj- this is the defining issue of the last thirty years. And KC- along with much of the ruling elite- got it completely wrong (despite masses of economic analysis that could have helped). And in my book, such a man cannot be trusted to make the right decisions in future. Apart from anything else, he'll ge up against Gordo, who- whatever you think about him- at least got the Euro right. Sure, let's move on- but that means drawing a line under KC. KC is vastly experienced and would be my first pick if he wasnt so pro-Europe. Im curious to see whether these recent comments on Europe are a one-off or if they are a genuine change of heart. I say give him time to prove it. If we list what the leadershio contenders have done to help the party get elected since 1997 I would suggest Ken wouldn't score too well. The article about the Labour deputy leadership in The Times is very insightful as to why Alan Johnson is seen as second favourite to be PM. He is a man that has the support of both the Blairite wing of the party, the Unions - and isn't in any way offensive to the electorate. Rightly or wrongly, Ken has been rejected by the party members pretty decisively in the past, not done much in the way of helping the party get re-elected - and I just can't see him uniting the party (a key task for the new leader). Although uniting the Party is important, it is no use to have a united party behind an unpopular, right wing set of ideas and a leader who is not viewed as a credible alternative PM. The greatest Tory leaders: Churchill, Disraeli, Macmillan, Thatcher were all very divisive figures in the Party. The same can also be said for Blair in the Labour Party. I think we have candidates better placed to win not only the heart and soul of the party, but ones who have worked tirelessly over the last fw years, and who are also more likely to win over the voters. I am a big fan of what may have been the best sitcoms of all time, the excellent US comedy Seinfeld. Watching one of Paramount's constant re-runs last night the issue of the political 'dream ticket' came up. 'Kramer' (the superb Michael Richards) was running in an election for president of the condominium board (Resident's Committee) as a 'puppet regime' for Jerry's father. Asked who the pair were running against Jerry delivered the superlative line: "Common sense and a guy in a wheelchair." When I later heard the news that Conservative Party wanna-be leaders David Cameron and old ham Kenneth Clarke were being touted as the latest Tory 'dream ticket' I thought for one minute it was yet another Paramount comedy re-run. But no, this is a serious proposition apparently. The Tory dream ticket is the latest attempt by the more obvious neo-liberals of the modern Tory Party to stop David Davis winning. So why would a Cameron/Clarke ticket be laughable? Well who in their right minds would trust a man who has pompously fought the European cause in the UK for decades while regularly 'spitting' down upon the heads of those who kept raising the small matter of the fact that it was destroying mainland Europe's economy and society? But the only problem I have with this Tory 'dream ticket' of losers is which of them is Morty (Jerry's father) and which Kramer? It should be obvious. But then Kramer wears silly clothes, smokes big fat cigars and is slightly 'out there' too. More importantly - who in the party would be George? Irrespective of his politics, Ken Clarke will be nearly 70 at the next general election. He looked overweight and unwell (blotchy face, perspiring heavily) when I met him in April. Is he phyisically fit enough to run an energetic Opposition and be Prime Minister afterwards? I have major doubts. 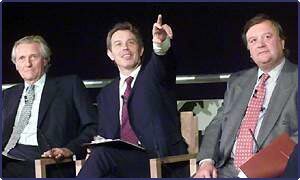 We need a fit leader (and Shadow Team) who can be Prime Minister for 10 years (like Blair). The public may view KC (unlike Brown) as a temporary, stop-gap leader and that could affect our electoral prospects. Just read Phillip Stephens article in the FT today. It sums up my views on where the party have been going awry. Funnily enough at my local Association meeting last night, there were quite a few folk coming (round) to the same conclusion. "Herein lies the Conservatives’ problem. They have spent the past decade talking to themselves. The voters have simply stopped listening." 2) Any candidate who focuses on a problem facing the Party without proposing a specific solution can be disregarded as being a self-evident lightweight. Rifkind, you have been warned. 3) Any candidate who indulges in gratuitous criticism of the Party should be invited to withdraw from the race (after all if they were applying to join the Candidates' list they would probably be expelled) and sent to spend a weekend with John Bercow. 4) Any candidate who sets out a vision for the Party, rather than a vision for the Country, should be required to write out in long-hand every posting on this Blog. Any more suggestions? There are some serious points here, admist the deterrents. On point 2, is there any truth to the rumour that anybody who wishes to stand for election in the future should sign a contract to ensure they dont speak or act out of turn? Apparently Francis Maude had kicked off that idea. I have read that MPs are not happy about being Members of the Approved List when an election is called as they could be removed like Howard Flight was. I certainly agree with your points (3) and (4). We are looking for a worthy Prime Minister more than we are seeking a worthy Tory leader. Our focus - the leadership candidates' focus - should be on Britain's problems - not our own. Find passion and solutions for Britain's problems and the Conservative Party's problems (lack of members, funds and popularity) will begin to take care of themselves. I'm not so sure about your point (2), however. Sure - we certainly don't want cheap talk but it's not always unreasonable to encourage discussion of long-term problems like energy insecurity and the pensions timebomb but without having ready-made policy solutions. You then ask: "Any more suggestions?" My big problem with the leadership race has been the lack of big ideas. Us Tory enthusiasts are blogging away but is anyone in the Dog & Duck or 2 Acacia Avenue (to use John Major's favoured locations for 'ordinary voters') talking about the leadership race? The question answers itself. I favour a ban on arms sales to repressive regimes. A ban would be good for national security and would remove a prop from some odious regimes. Today's Sun calls for the Tories to consider a flat tax. A serious war on drug consumption might also catch attention (and be right! ).